Pioneering gay rights activist Harvey Milk was assassinated 34 years ago today on Nov. 27, 1978. Milk is the first* and most famous openly gay male elected official in California, and perhaps the world. He became the public face of the LGBT rights movement, and his reputation has continued to grow since his death. He has been called a martyr for LGBT rights -- and for all human rights. “If a bullet should enter my brain, let that bullet destroy every closet door in the country,” Milk once said. Two bullets did enter his brain, and his vision of LGBT people living openly is also coming true. Milk (1930-1978) served only 11 months on the San Francisco Board of Supervisors before he was killed, but in that short time he fought for the rights of the elderly, small business owners, and the many ethnic communities in his district as well as for the growing LGBT community. Shots fired by conservative fellow supervisor Dan White cut Milk’s life short. More than 30 years later, the hope and the movement for LGBT rights are more alive than ever. Milk has received many honors for his visionary courage and commitment to equality. He is the only openly gay person in the United States to have an official state holiday in his name. Harvey Milk Day is celebrated in California on Milk’s birthday, May 22. The bill establishing Harvey Milk Day was signed in to law in fall 2009. State employees still have to work on Harvey Milk Day, but California public schools are encouraged to teach suitable commemorative lessons about the gay rights activist. He is the subject of two Oscar-winning movies, “Milk ” (2008) and “The Times of Harvey Milk ” (1984), as well as the book “The Mayor of Castro Street ” by Randy Shilts. The Harvey Milk icon painted by Robert Lentz (pictured above) was hailed as a “national gay treasure” by gay author/activist Toby Johnson. Milk holds a candle and wears an armband with a pink triangle, the Nazi symbol for gay men, expressing solidarity with all who were tortured or killed because of their sexual orientation. It is one of 40 icons featured in the book “Christ in the Margins ” by Robert Lentz and Edwina Gateley. The icon has also been criticized for portraying Milk, a secular Jew, in a iconographic style rooted in Christian tradition. “The fact is that more people have been slaughtered in the name of religion than for any other single reason. That, that my friends, that is true perversion!” He is honored in the interfaith LGBTQ Saints series here as a martyr who died in the struggle for gay rights. This post is part of the LGBT Saints series at the Jesus in Love Blog. 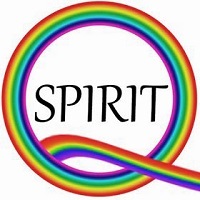 Saints and holy people of special interest to gay, lesbian, bisexual and transgender (GLBT) people and our allies are covered on appropriate dates throughout the year. Happy 7th birthday, Jesus in Love!